It's amazing they get so much serious work done, with all the jokes and puns thrown about. Uh Tony, I think I'll skip launching at that beautiful Australian boat launch with 4 fresh water hoses. I bet you use the hoses with one hand to push the crocks back, while you step the mast with the other hand. Say, how often do they actually attack humans? Oh that's just Snappy, the family pet. He gets excited when the family goes out for a drive and insists on jumping in the back. I bet our Orcas could take your crocs. Crikey Geordie, looks like that big fella had one to many Bobs. Down this way it's a ritual to sacrifice the 2nd of your offspring to the Croc God. Last edited by Slaughter on Sat Mar 23, 2013 5:09 pm, edited 2 times in total. To answer to your question to Tonystott, try googling "NT News front page" for a week or so and see how many croc stories you get. 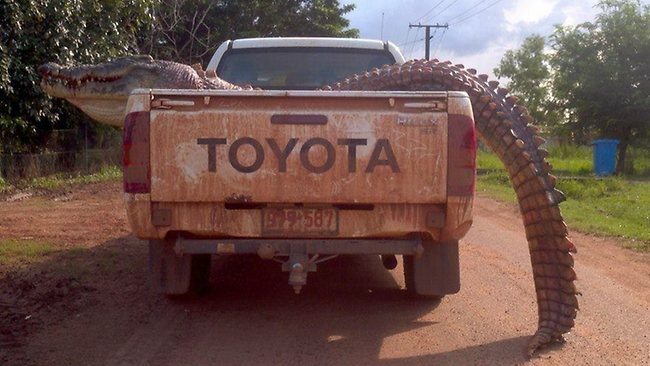 Something like half a dozen a year get taken, the crocs seem to have an appetite for European terrorists (oops ... sorry...Tourists).
" The number of estuarine (saltwater) crocodiles removed from Darwin Harbour by Northern Territory Parks and Wildlife Service rangers since January 1st 2013 has reached 166 with three removed from Ludmilla creek near the sewerage ponds last night. This is an increase on the number caught in Darwin Harbour where rangers removed 392 estuarine crocodiles during 2012. "Now Google earth Darwin Harbour...when they CATCH 3-400 a year out of that relatively small area thats a hell of a lot of snappers, and those are only the ones they catch in their traps! 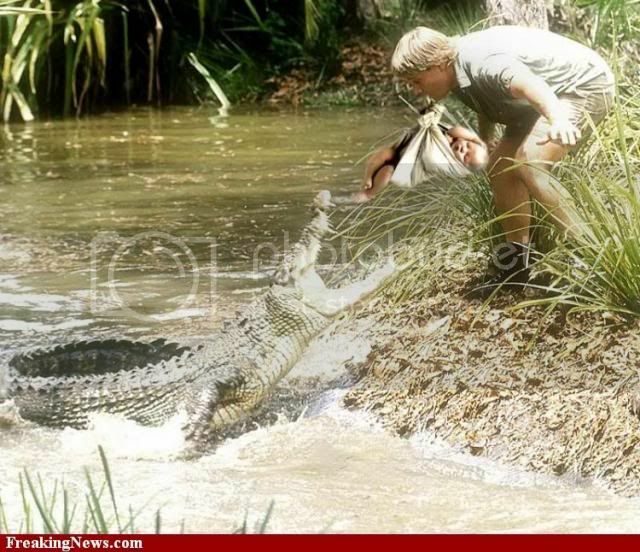 Nice shot of the incredible Steve Irwin Slaughter...very funny piccie caption of yours too. Hey Tony, the waters you sail in look so clear and pristine... so much so I can see SOMETHING BIG WITH WHAT LOOKS LIKE OPEN JAWS coming up under the stern of your TI!!!! "Croctastic! NT News devotes front page to FIVE crocodile stories on one day"
And the pics of both tourists and locals offering themselves as croc bait are incredible. Is that why they named the city Darwin? When I bring my TI down there I think I'll leave my crocskin slacks and boots at home. Wouldn't want to upset the local fauna. Ah ha, a happy customer...glad it appeals to you Puget. You'll notice that front page picture of the croc tearing into a beef carcass and the headline about the croc dining on cow? Well now you know why Cowsgomoo stays well south of the crocodile region, and why his signature 'avitar has a look of consternation upon its face in case he does! That will be a pretty expensive proposition bringing your TI out for a visit. 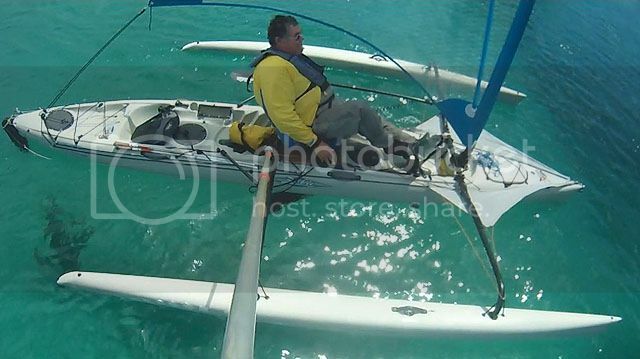 Wonder one of the lads here can't organise a loan TI for you from a friendly Hobie dealer. Pity you're not coming to Darwin, I get pretty lonely up here with no Islands to sail with! Sorry, the wife says nay to any water (or land) with "those creatures." That's my excuse and I'm standing behind her.